Take a look around a network printer in most schools and you'll find a pile of discarded paper. That discarded paper is often the result of someone printing way more than they needed to. For example, I once caught a student printing all 33 pages of an article when all he really wanted was about two paragraphs out of the article. It was then that I decided that I needed to teach my students about conserving paper when they print. The easiest way to save paper is to simply make sure that you're only printing what you need. When the print dialogue box pops-up select a specific page or two to print rather than using the default "print all pages" found on most printers. Printliminator is a handy little bookmarklet for Firefox, Chrome, and Safari. Printliminator allows you to highlight a webpage and select only the elements which you wish to print. You can install Printliminator in seconds by just clicking and dragging it into your browser's toolbar. Watch the video below to see how it works. 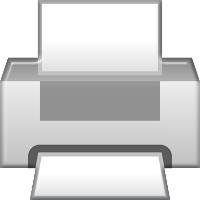 Evernote users can use the Evernote web clipper to save and print articles that have sidebar content removed from them. To use this option simply open the Evernote web clipper in your browser then select "simplified article."